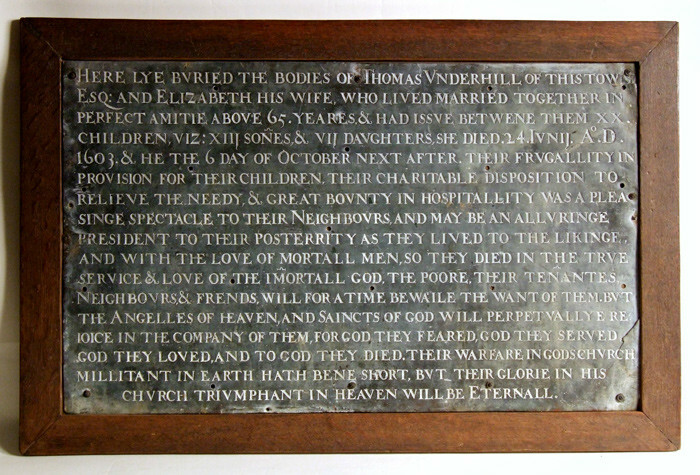 A very interesting and rare engraved brass memorial plaque to Thomas Underhill and his wife Elizabeth, dated 1603. 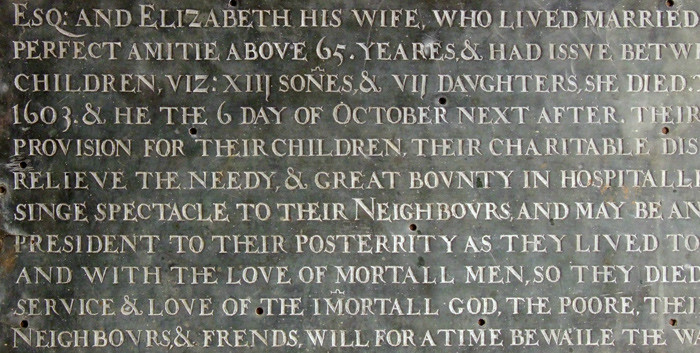 With lovely soft patination, beautiful engraved lettering, and charming archaic spelling and language, the plaque is redolent of the late Elizabethan age. 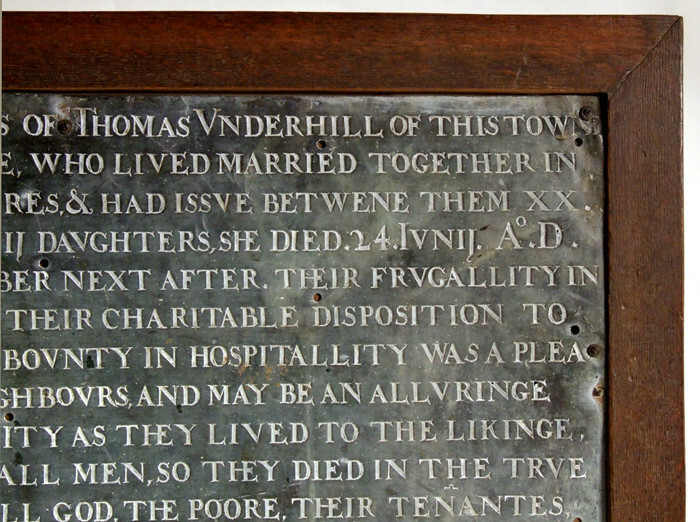 This "document" of Thomas's and Elizabeth's life shows to all who read it that they lived together in "perfect amitie" for 65 years, had 20 children, and were good, hospitable, generous people who were loved by their friends and neighbours - this is a little "picture" of the lives of these people. 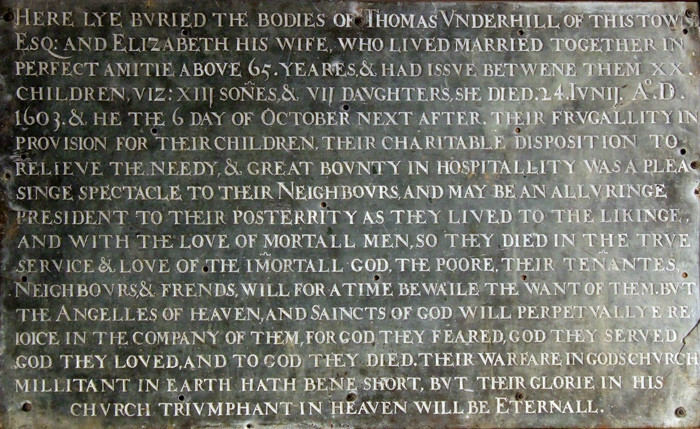 The Underhill family came from Warwickshire. Although we don't know Thomas's exact place in the family, a relative of Thomas's, of the same name, was Keeper of The Wardrobe at Kenilworth Castle for Robert Dudley, the suitor (and some would say lover) of Queen Elizabeth 1st; another relative, Hugh Underhill, was Keeper of the Wardrobe for Elizabeth at Greenwich Palace in London, one of the most important positions at Court. English, circa 1603. Width (incl. 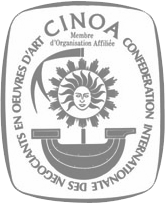 frame) 31 3/4" (80.6cm).